For information about our 12 Nights of Chocolate, including tickets, click here. Since the earliest days of Dandelion, we’ve always dreamed of having an advent Calendar to count down the days until Christmas. Opening up the small doors and finding a little treat was a special part of our childhoods. This year, we were finally able to make this dream a reality with the help of our friends. Designed by the talented Yvonne Mouser and featuring confections made by our very own chef, Lisa Vega, and our friends at Poco Dolce, Le Dix-Sept, Kika’s Treats, Nosh This, and Feve, we are proud to announce the first ever San Francisco Pop-up Advent Calendar. Pre-sales start today for shipping on November 23rd. We’ve made a limited set of 300 and they are available for $150 in our online store. We just received our spectacular Advent a Calendar!! 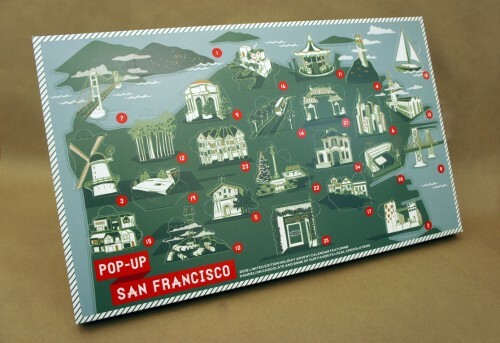 An amazing structure with San Francisco highlights, delicious nibbles, and hidden individual product descriptions.